Get ready for the food to start flying as your Teflon Chef teams face off against each other in a frenetic culinary battle of champions. The Teflon Chef culinary team building exercise is an Iron Chef style team building activity that gets your team cooking up the ingredients to make a great team! In this hands-on cooking team building activity the group chooses beforehand which Teflon Chef battleground to compete in – Italian, French, Mexican, Organic, seafood, beef, poultry or vegetarian. During the cook-off, the Iron Chefs race to complete different parts of a definitive multi-course meal. Test your cooking, negotiation, bartering, and buying skills by best utilizing the budget allotted you. Buy key ingredients or hire our consultant Teflon Chef (who won’t cook for you, but will be happy to help with your team process and get you going in the right direction). The competition is fierce, and speed is critical. To add to the drama, the Mystery Ingredient Du Jour must be prominently used in all of the dishes. This magic ingredient could be anything from king crab, ketchup, or lemon grass to lettuce or lobster. As you might imagine, the results can be a little crazy – around here, foie gras ice cream comes with the territory. A distinguished group of discerning and hilariously outspoken judges determine who reigns victorious. But regardless of the outcome, you’re guaranteed one thing – if you pick Quixote Consulting’s Iron Chef style Cooking Team Building exercise, nobody will go away hungry! The Teflon Chef - Iron Chef Cooking Team Building and Culinary Team Building activity has an optional debrief that can be led by a trained facilitator around recognizing team strengths. 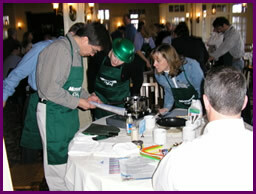 Teflon Chef - Iron Chef Cooking Team Building and Culinary Team Building lasts two to three hours. The Teflon Chef - Iron Chef Cooking Team Building and Culinary Team Building activity can be done in virtually any venue indoors or out.